Ship Island Excursions offers daily passenger ferry service to Ship Island and Fort Massachusetts (circa 1858), part of Gulf Island National Seashore. 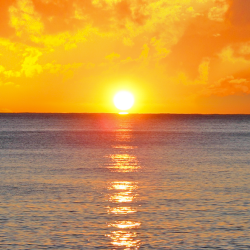 The island is approximately 10 miles offshore from Gulfport/Biloxi offering visitors beautiful high quality beaches, and clear Gulf waters for swimming, shelling, birding, sunbathing and more. The cruise to the barrier island takes about an hour one way, and dolphin sightings are frequent during the boat ride! Food service, chair, and umbrella rentals are available on the island. 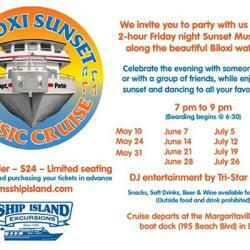 Ship Island Excursions-Biloxi is located at 195 Beach Blvd at the Margaritaville Hotel Biloxi Resort. 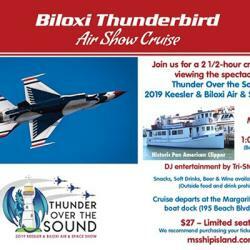 Ship Island Excursions is located in the Gulfport Yacht Harbor at the intersection of Highway 90 and Highway 49.
click for full schedule and prices. Take a Google Trekker tour of Ship Island. 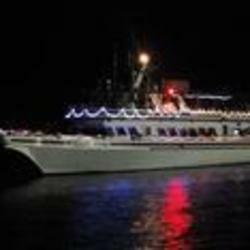 Climb aboard and be a part of the Biloxi Christmas on the Water boat parade with the Mississippi Gulf Coast Attractions Association! 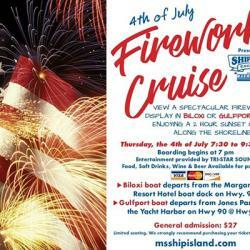 There will be food, door prizes, raffles, and at the end of the parade a fireworks show. The Captain Pete parades with all the other boats in Biloxi's Christmas on the Water serving heavy hors d'oeuvres provided by various coast restaurants. Cash bar, No BYOB or Coolers Allowed. Tickets available online. Sponsored by the Mississippi Gulf Coast Attractions Association.